I have always associated adaptation with oversimplification. My first encounter with the word was on the cover of a gift copy of A Christmas Carol that had been, so said a note on the title page, SPECIALLY ADAPTED FOR CHILDREN. Not only was the plot chopped into hash, but the genius in charge had decided modern American children would retreat in confused chaos if confronted with archaic words like "humbug." "Christmas!" said Scrooge. "Oh, phooey!" It's a wonder I didn't give up reading entirely. My first encounter with Victorian knitting was also via unfortunate adaptations, courtesy of a book published around the same time as my Phooey Edition of Dickens. The projects were a mixed lot -- hats and scarves and whatnot -- but they were all SPECIALLY ADAPTED FOR THE MODERN KNITTER. This meant the gauges were elephantine, the details were minimal, the yarns were 100% petroleum, and the patterns were as authentically Victorian as Judy Jetson wearing a bustle. "Adaptation!" said Franklin. "Oh, phooey!" I swore when I began writing this column that I would translate, not adapt. I'd substitute modern yarns, of course. I'd fill in gaps. I'd correct errors. But I would not adapt. The aim was to make historic patterns appealing and accessible to a broad audience. Adaptation would dilute and distort the experience. But lately it has struck me that by always insisting that we stick close to the original path, I run the risk of doing exactly what I hoped to avoid: putting the old patterns into a special enclosure, apart from the rest of knitting. We don't hesitate to fool about with modern patterns, do we? No, we do not. We change necklines, change yarns, re-shape and adapt to suit ourselves. And so we may do with antique patterns. When I ran across the Templeton Square in Weldon's Practical Knitter (Fourth Series), I knew I wanted to make it. I also knew I did not want to make it as written. The Templeton Square is a building block for a counterpane (in the same manner as the Star Block). The fad for knitting counterpanes meant publishers cooked them up in profusion. This one struck me because of its unusual simplicity -- no fancy edges, no bobbles, no fuss, just bold geometry. However, the construction is deceptive. You don't knit the square in one piece. You work four identical triangles, and then you sew the triangles together into a square. And then you sew the squares together to make the counterpane. And then you never finish the counterpane, and the counterpane sits in a bag in the bottom of the stash cupboard, and every time you open the cupboard you feel guilty and slightly sick. 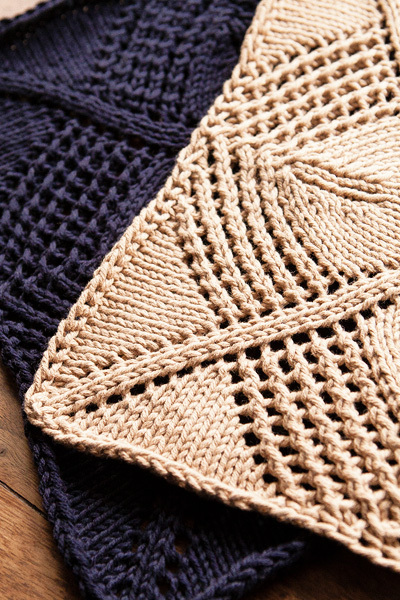 Knitting triangles made good sense in the 1880s, when the only way to work the square in a single piece from the center out would have been on four double-pointed needles. As the square grew, it would have been necessary either to switch to very long needles -- or to add a bunch more of them. I have a large bundle of 19th century dpns in my collection. I calculated that it would have taken something like eight or ten to go all the way around the piece at its largest. Doesn't that sound like fun? In 2012, we have circulars. Rather than four/eight/ten needles, we can get away with one or two. And so I re-wrote the pattern to take advantage of modern technology. There's also no shame, by the way, in making smaller adaptations if you so choose. Take increases and decreases. The original pattern uses an increase I'd not run into before. It requires you to slip the right needle into the stitch as if to purl, twist the needle around, and then knit into the stitch before removing it from the left needle. Here's the thing: It's hard to do and it looks like hell. You'll notice that I made two Templeton Squares, in contrasting colors; but two squares do not a counterpane make. That's because for this issue, I wanted to give you a pattern and then see what you do with it. We're going to have a contest, kids! 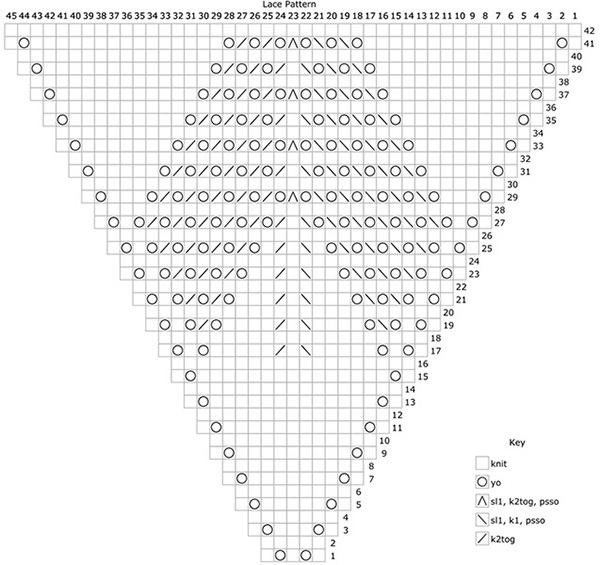 Use the Templeton Square pattern below as the basis for a finished project. It can be anything at all: a coverlet, a piece of home decor, a garment, a party tent -- the type of project is up to you. The only requirement is that the Templeton Square must be a prominent and essential piece of it. The judges will be judging from your photos so make sure they are lovely and in perfect focus, no smaller than 750 pixels wide. Include a short paragraph describing your piece, including your inspiration. 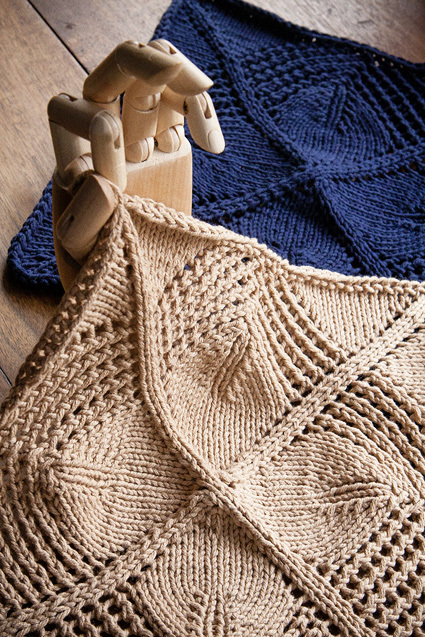 Tell us your name, email address and what yarn was used for the project. Winners will be announced in the Surprise for the Spring+Summer Issue of Knitty in mid-April, 2013. Note: 1 skein will make 2 squares. Note: the piece is worked from the center out, and so we recommend using Magic Loop or 2 circulars; if you prefer, you can start with a set of 5 dpns and change to a 16 inch circular as the piece gets big enough. The piece is begun at the center with Judy's Magic Cast On and worked in the round. 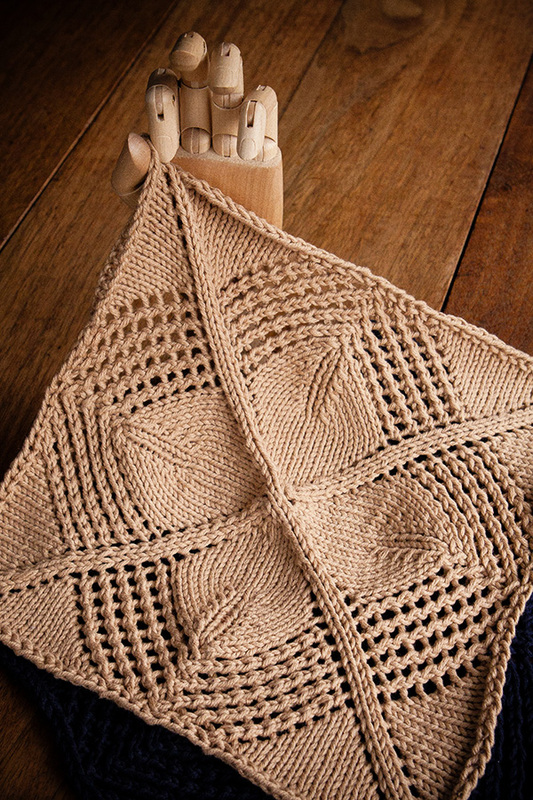 To allow the square to stretch fully during blocking, use Jeni's Suprisingly Stretchy Bind Off. Using Judy's Magic Cast On, co 8 sts. Next round: Work Chart 4 times around. Work as set until all Chart rows are complete. Bind off loosely with Jeni's Surprisingly Stretchy Bind Off. Soak and block firmly, taking care that all sides are of equal length. Allow to dry completely. Weave in ends. 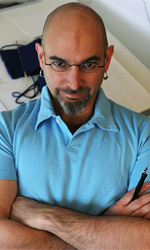 Franklin Habit is the author of It Itches: A Stash of Knitting Cartoons(Interweave Press) and proprietor of the popular knitting blog, The Panopticon. He travels widely to teach knitting and photography, and his work appears with shocking regularity in perfectly respectable fiber arts magazines and books. Franklin is most commonly worked from the center outwards beginning with a surprisingly stretchy center, but his seams keep coming apart.